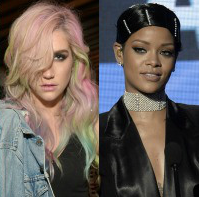 Rihanna gets raunchy with Ke$ha using nail art. Rihanna can't just show off a wild and vibrant set of Christmas nails, accented with gold rings and bracelets. She did all that, but she also slid in a racy reference to singer Ke$ha. RiRi posted the photo shown on December 22, writing, "Christmas nail swag! #lookinlikeijustfingeredKesha#SantaHat #Mistletoe #SnowMan #CandyCane." And yet ... with all the sparkly colors, she kinda does look like she did that. ^^I was just thinking that. Her hands look nasty and pale. She act dirty...why not look it? It look like she could've been masturbating as well, trash.